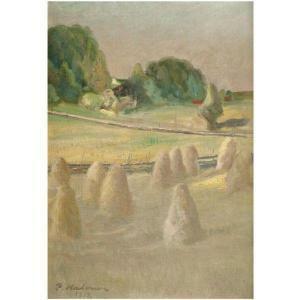 Find artworks, auction results, sale prices and pictures of Pekka Halonen at auctions worldwide. Sign. -91. Oil on board, 39x44 cm. 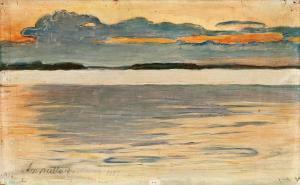 Judge Tokolander bought the painting from the artist, later he sold the work to Mr. Meriaho. 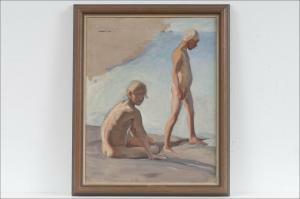 Since 1957, the painting has belonged to the Mäklin family. 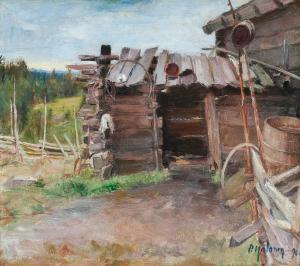 The painting was created on a trip to Eastern Carelia where Pekka Halonen travelled together with Akseli Gallen-Kallela and Louis Sparre. 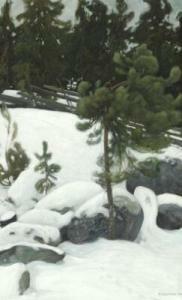 45 by 31cm., 17¾ by 12¼in. RANNALLA - BARN PÅ STRANDEN. äkthetsintyg av Marja Halonen och Ivar Hörhammer.